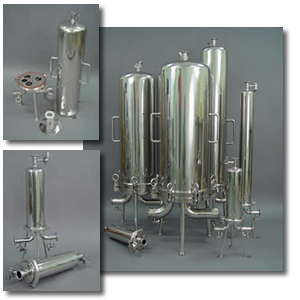 CSH sanitary housings have been designed for high purity and critical applications. single cartridge sanitary housings are available in T-style or Inline configurations and offered in lengths from 5 through 40 inches. multi cartridge sanitary housings, available in 3,6,8,12 and 21 round models with swing bolt closures that are a proven design suited for high purity beverage, chemical and pharmaceutical applications. All are manufactured in 316L Stainless Steel with a 25 RA internal finish. CSH housings are standard with 2-226 style cartridge adaptors giving you a positive locking tab seal. This allows flexibility in one housing to use different cartridge lengths and maximize filter performance and cost. Please select the model below for detailed specifications and drawings. All multi round housings have a removable tube sheet so that all surfaces are cleanable.